Loish is among the artists in the inspiring Art Makers tutorial series. Adobe has unveiled a new series of weekly video tutorials featuring top artists from around the world. The Art Makers: How Did They Do That? collection sees artists guide viewers through their workflows in Photoshop, Illustrator and Animate, giving key insights into how they produce their unique styles. 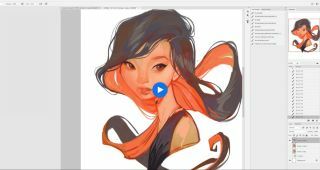 The initial collection of videos features Dutch artist Lois van Baarle (aka 'Loish') creating a portrait called Red, beginning by making rough sketches from a stylus and tablet and building the piece using different Photoshop brushes. She does all of her digital painting on one layer, despite changing brush shapes, brush thickness and colour. Loish's video tutorial is accompanied by written steps on the Adobe site. Adobe hopes the videos will inspire creatives to give new techniques and tools a try. It says: "Feed your (inspiration) with this series that profiles art makers from around the world. See how they sweat the details, applying their own techniques to create images, illustrations, and animations using common and not-so-common features in Adobe Creative Cloud apps." Another of the videos features Egyptian artist Amr Elshamy creating his Round Things artwork, which you might recognise from the latest Photoshop CC splash screen. Elshamy used Photoshop CC's Polar Coordinates distortion filter to turn a photograph of a mountain range into his unique finished image. Elsewhere, Italian artist Daniele De Nigris creates geometric tile patterns in Illustrator, creating the image that was used for the Adobe Animate CC 2017 splash screen. Plus American designer and illustrator Molly Scannell makes a powerful sliced collage in Photoshop; Turkish photographer and designer Şakir Yildirim makes a surreal image in Photoshop; and French-born Toronto-based illustrator and animator Emilie Muszczak makes a colourful animated self-portrait in Photoshop and Animate. The series is featured online on Adobe’s Create Magazine, and on Adobe's Art Makers YouTube playlist, which it says will be updated weekly with new content.